Director Terry George dealt with the subject of genocide previously in the excellent “Hotel Rwanda”. 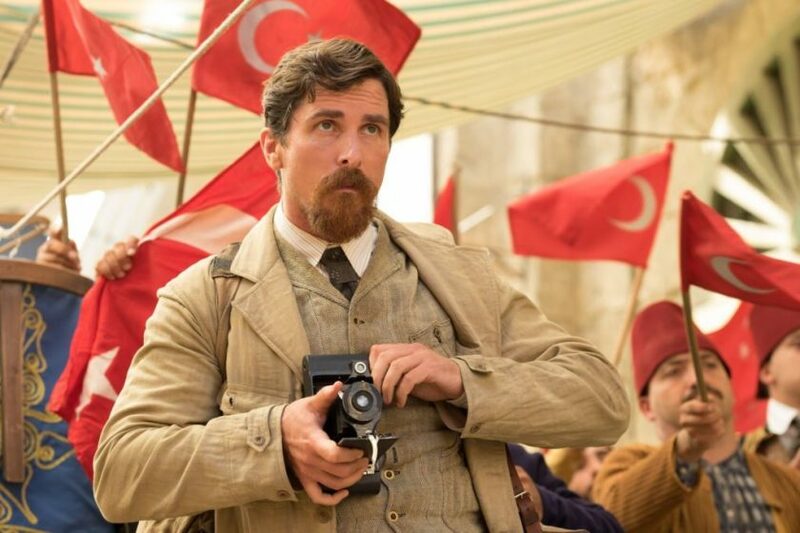 This film covers that same theme but this time his subject is the Armenian genocide by the Turks at the time of World War 1 – an act that Turkey still denies ever happened, despite the many witnesses to the atrocity. This is, I think, the first English language popular appeal film about the murder of the Armenian people. Canadian Armenian Atom Egoyan’s time splitting “Ararat” (2002), while fascinating, was I think it fair to say, more of a minority appeal art movie. So it is indeed high time for this particular piece of history to reach a wider public. George uses a romance to tell his story, which opens in 1914. Michael (Isaac) lives in a small village in Southern Turkey. His dream is to be a doctor and when he becomes engaged to Marta (Shohreh Aghdashloo) he uses her dowry to take himself to Constantinople to study medicine, planning to return once qualified and bring modern medicine to his community. There he meets American journalist Chris (Bale) and Chris’s Armenian artist girlfriend Ana (Le Bon) and, perhaps somewhat predictably, Michael and Ana fall in love. But the advent of the war, the Turkish alliance withGermany and the subsequent persecution of the Armenian population by the Turks all put personal matters on the back burner, as the three friends struggle to survive. Director George says he took his inspiration from various epic films, which have dramatized and personalized big historical events. One of them was “Dr Zhivago” and this film has a lot of elements in common with that. The doctor (or medical student in this case), who is forced into a war which destroys his culture; a conflicted love story in which both parties are committed elsewhere; and an epic journey. But while Zhivago dealt with a social class being eliminated, this is about the attempted destruction of a whole race. So it also has echoes of the Holocaust – mass imprisonments, torture and executions, labour camps and people being forcibly moved around in cattle trucks. All told through the story of one man’s journey through these horrors. Isaac as Michael gives a strong central performance. It is very much his film – Bale as Chris is more in support, though when he has his moments centre stage, particularly towards the end of the film, he seizes them well. Le Bon is an appealing heroine – she has a touch of Keira Knightley about her. Particularly impressive in a supporting role is Dutch actor Marwan Kenzari as their aristocratic Turkish friend, who risks his life for both Michael and Chris and pays the price. I look forward to seeing more of him. It also provides a bit of balance to have a sympathetic Turkish character in a story, where all the other Turks are pretty villainous and rather one dimensional. The film holds the attention throughout and engages us emotionally and although it doesn’t achieve the epic grandeur of Lean’s Zhivago, it is a good, story, well told and one that deserves to be told.